Procedural textures are explained in this station. It is only the starting point to this complex topic. Run the script and check the functionality of the functions. Change the parameters of a texture. Set material and texture to a new object. All types in one image – the mapping types will be shown in a separate station. 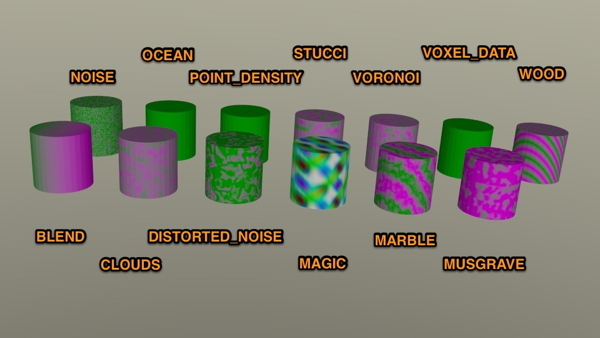 On the picture you can see the names of the textures and how the rendered objects looks like.
""" Put a procedural textur on a object.""" Run the script, set the camera on the right position and start the menu sequence: Render » Render Image. Every texture has more or less parameters. In the property panel all parameters are changeable. The names of parameters are printed with the dir command.